Pride centres on a group of gay and lesbian activists inspired to support a small welsh mining town in their strike efforts during the 1984/5 miners’ strike. Seeing a shared enemy – police, Tory policy, Thatcher – Mark Ashton and his mates and the men and women of the Dulais Valley form an unlikely alliance in their struggle to achieve fairness and equality. 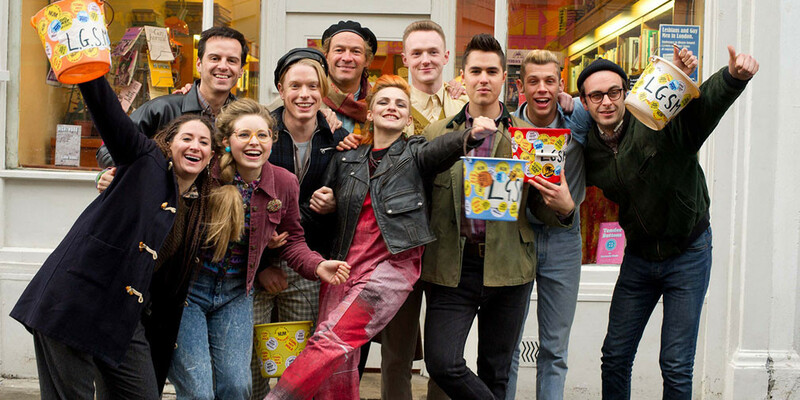 In the mould of other British classics such as Billy Elliot and The Full Monty, Pride doesn’t go for cheap, sentimental heart-string-tugging, focusing instead on harsh realities and true friendships. Based on the true story of LGSM, Pride is a funny and fierce – if somewhat embellished – account of a period of Welsh history more often than not forgotten. It’s also really, really lovely. If you haven’t seen this film then you could do a lot worse that to put that right. I loved every second of it. One of the best British films for ages. Last night I watched The Fifth Estate – “the Wikileaks movie” – mainly off the back of the fact that I’m reading about Edward Snowden and CitizenFour is proving an elusive flick to find. I have to say, I don’t know why it took me so long to watch it! For those who don’t know, The Fifth Estate is a semi-fictionalised account (if you ask Assange, at least) of the rise of Wikileaks, the complex relationship between its founder(s?) hacker Julian Assange and techie mate Daniel Berg and the shitstorm that blew up after the publication of the cables and war logs leaked to the site by Chelsea Manning. It’s also really, really good. Okay, there’s no question that the film is one man’s story – Berg and Assange are, let’s say, no longer sending each other Christmas cards. But the important thing to remember is this: if you want to know about Wikileaks and the work it does, do to the site and do some reading. If you want to watch a thriller based on exciting and interesting recent events then the cinema is the place to go. I didn’t care that it was all a bit OTT and, having done my reading, that it played with the recorded truth more than a little. I enjoyed the film for what it was: a film. There are some smashing performances here. Benedict Cumberbatch as Assange shone and every member of the supporting cast did a fantastic job. There’s a hint of The Social Network about The Fifth Estate, in the sense that it glamorises the mundane to a point where a man typing a word on a laptop is exciting. As a thriller, it works. As a document of fact, maybe not so much. But then, it’s not a documentary – it’s a thriller. And Doctor Who is in it. Sherlock AND Doctor Who! If that’s not enough for you then what on earth do you want?! Right? If the answer to that is “but Gareth, we aren’t interested in celebrity. We don’t care if Doctor Who is in it, we want to know about the events, the backstory and the workings of Wikileaks…” then I suggest you dig out the fantastic road-trip documentary We Steal Secrets, as close to an official telling of the story as you’re ever likely to get. In the mean time grab a cup of tea or a beer, settle on the sofa and watch The Fifth Estate on DVD or something. It’s great fun. Really, it is. I wanted to hate it and I didn’t. Which, I suppose, is a good thing! I love the Jurassic Park movies. The first movie is a masterpiece, its dinosaurs are still the most realistic-looking in any movie before or since. Even the CGI has held up well! I have a soft-spot for The Lost World and Jurassic Park III too, mostly due to the memories of childhood(ish) cinema trips connected to them. So it’s no shock to you that I am incredibly excited by the possibly-rubbish, hopefully-awesome Jurassic World (COMING SOON) – the trailer for which arrived online two days before its advertised premier at some American Sporting Event Of Some Kind. Take a look! Also, sorry I’ve not blogged in a while. We’ve been dealing with some very difficult family issues this week and I haven’t had time to do anything at all. Now that’s hopefully coming to a close I will be able to resume blogging (and return to work too).